It’s interesting to watch the evolving process of incorporating Social Media and Internet / Digital Marketing into the larger established businesses and organizations, and translating this to the opportunities and learnings that exist for Small to Medium size companies. 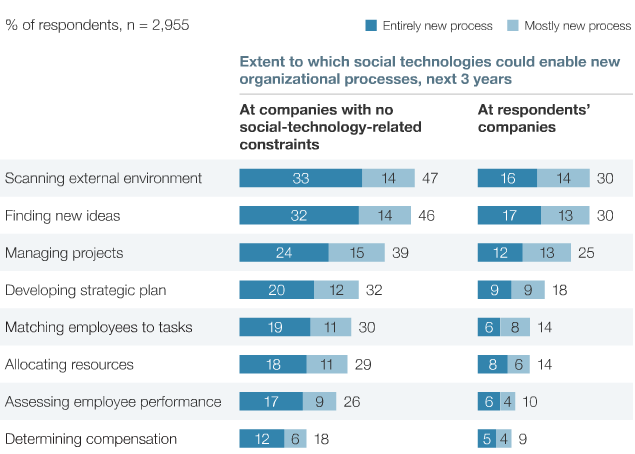 McKinsey just published their latest Global Survey Results, which shows increased adoption of the new social technologies but with some initial benefits beginning to plateau. As usual it takes the quality leadership skills to identify the most effective Social Media / Digital Marketing solutions applicable for individual company needs, those that become “networked organizations” are expected to reap the rewards and benefits of the new technologies. McKinsey also lists “Six Social Media Skills every leader needs” from research with General Electric (can’t get much bigger). – i.e. the digital age is only beginning, so it is imperative for management to keep up to date experimenting with new technologies and media opportunities. Overall these leadership skills are not new, but leaders need to adapt them to the new business environment of collaboration that challenge the organization’s social and political inter action. The underlying dilemma for large organizations is that Social Media challenges the current power pockets and business processes in the company organization. This will take time to evolve, which is all good news for the smaller / medium size company competitors, to capitalize on the “adoption gap” that exists between small and large organizations. Small to Medium size companies still have a significant opportunity to realize the benefits of social technologies quicker than the large organizations which are constrained by the existing structures, processes and mind set / culture.